This page contains important information for all Prospective Puppy Owners to take into serious consideration when choosing a Breeder. Unfortunately there are many unscrupulous breeders in South Africa that promotes their dogs as registered, well bred and healthy, which is unfortunately not true. We would like to help all prospective puppy owners to make the right decision when choosing your puppy and your breeder. Only the Kennel Union of South Africa is an accepted registry of Purebred Golden Retrievers. Any other organisation is not affiliated to FCI. Unfortunately in every country and with every breed there is inevitably those that dont have the best interest of the breed at heart and theirr only motivation is to line their pockets with the income from breeding litters. Golden Retrievers are one of the world's most popular breeds and it is therefore very easy to make a lot of money from puppy farming. In the 13 years that I have been involved in Golden Retrievers I have heard and seen horrifying things happen to the Golden Retriever Breed in South Africa and since the breed is one of my greatest passions in life, I dont just stand by and let things happen. There is not a lot that one single person can do, but we try by educating the public NOT to support these breeding farms and to rather go to reputable, respective and accredited breeders - yes, you might end up paying a bit more for your puppy but there is no price that can be put on a healthy, well bred golden retriever that should live a happy, healthy life up to +-15 years. Throughout the years I have had a lot of distraught puppy owners contact me with issues with their young puppies - puppies dying at a very young age, having eye problems, etc. We are dealing with "live stock" here and although we can never gaurantee a perfectly healthy puppy, reputable breeders do the utmost to ensure that we breed with the healthiest dogs possible AND that we provide the owners with all the help, advice and guidance that we can. What Does Health Checks mean? ALL HEALTH CHECKS FOR BOTH PARENTS TO BE DONE - INCLUDING HIP AND ELBOW GRADINGS, EYE TESTS AND DNA TESTS. BREEDING OF ANY SCORE BELOW A "C" IS UNACCEPTABLE. WHERE POSSIBLE ASK ABOUT PROBLEMS THAT THE PARENTS OR THEIR PARENTS MIGHT HAVE HAD OR PRODUCED - A GOOD BREEDER WILL BE OPEN AND HONEST ABOUT THIS. VISIT THE PUPPIES AND SEE WHERE THEY ARE RAISED - THEY SHOULD NOT BE RAISED IN KENNELS. ASK IF THE BREEDER IS ACTIVELY INVOLVED IN ANY DOG SPORTS - SHOWING, OBEDIENCE, TRIALS, ETC. PARENTS AND PUPPIES MUST BE REGISTERED WITH KUSA (The Kennel Union of South Africa) - NO other registering body is accepted. Don't fall into the trap where the breeders advices you to refer to the parents of the Dam and Sire for health checks - this does NOT mean the parents of your puppies will NOT have health problems. 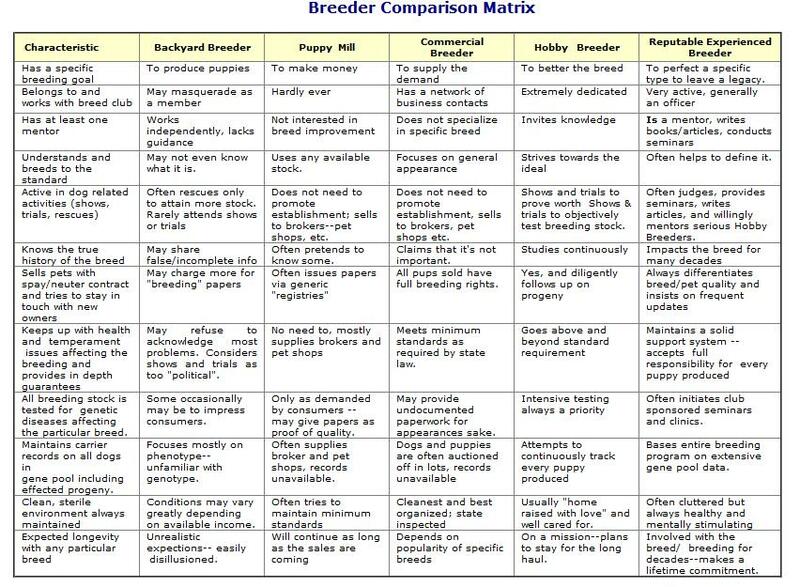 Beware of Breeders that always have puppies READILY available - reputable breeders dont breed often and usually have waiting lists. Its best to WAIT for a well bred puppy! Research different breeders and their dogs and select adults that YOU like as the offspring will end up looking like the parents. Interact with the parents (where possible) as the temperament of your puppy will most likely be similar to the parents. Ask for Temperament Assessments to be done by Accredited Animal Trainer / Behaviourist to match the correct puppy to your home, family and lifestyle. If you are an active family you would not want the most placid and calm puppy necessarily and vice versa.